We have enjoyed very much the apartment and like it very much . The only remarks : the lack of air conditioning in the bad room and the air conditioning in the living room did not work . it is also recommended to put more toilet paper , garbage bags and bigger soaps . Very friendly welcome. Spacious apartment. Nice terrace. Great location. Good services. The closeness of the supermarket is very convenient. Un bellissimo appartamento situato molto centrale, a due passi della Fontana di Trevi - grazie per il bellissimo soggiorno. Very nice apartment, incredible location, very helpful staff, we definitely recommend it!! 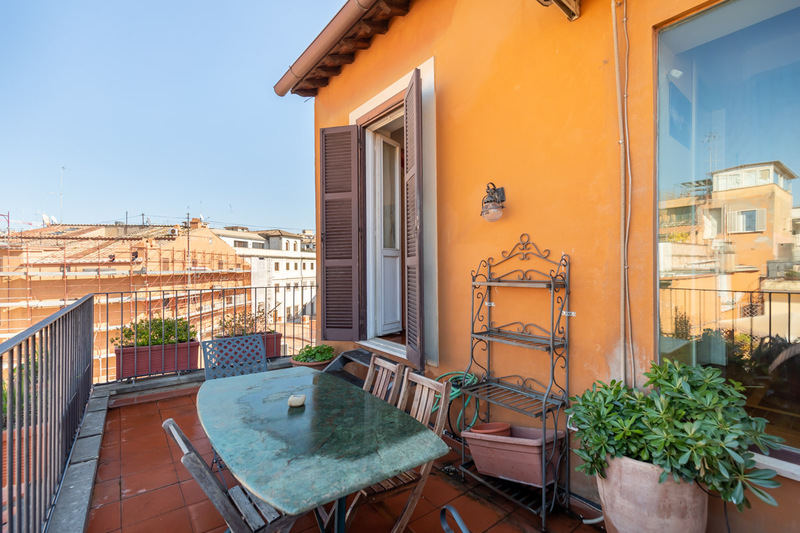 You will find this Rome apartment between the Trevi Fountain and the Spanish Steps. These are two of the most important landmarks of the Eternal city. This property is a top choice for guests who wish to stay in an extremely central location, while being very close to public transportation. This comfortable apartment offers plenty of living space. You can access it on the 5th floor of a building with a lift. Lovely large entrance hall welcomes you with its wonderful wooden beam ceiling and elegant antique furniture. Nice carpets decorate the parquet floor as well as the wall of the hall. The bright and spacious living room offers original wooden furniture: a display cabinet, a coffee table, side tables, chairs and antique lamps. You’ll also find a plush double sofa bed. The terrace can be accessed through the living room. There, you’ll find chairs and a table. Here you can enjoy a lovely meal on warm summer nights. The living room opens up to the dining room which is made up of a table with 4 chairs and interesting decorative accents on the walls. 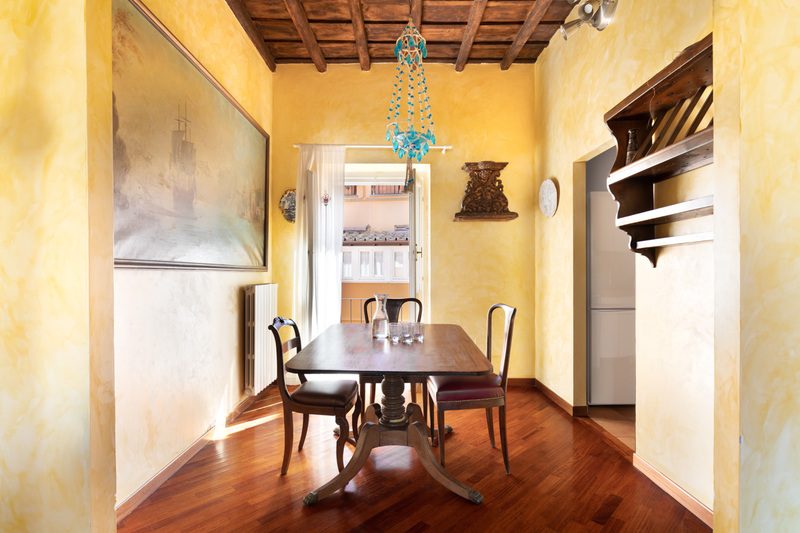 Adjacent to the dining area you will find simple kitchen with a wooden beam ceiling. This offers everything you would find in your own home. You will have an oven, a stove top, a refrigerator, a toaster, a tea kettle, kitchenware, and a dishwasher. The sunny master bedroom has a comfortable king size bed, night tables, a large chest, and two chairs. It also boasts a colorful wall carpet and a wooden beam ceiling. The second bedroom offers two single beds, an antique desk and chair. It also has the fantastic feature of the balcony. To make your stay even more comfortable, the apartment provides 2 airy bathrooms. The first has a shower and the other a bathtub. The apartment also gives you access to air conditioning. 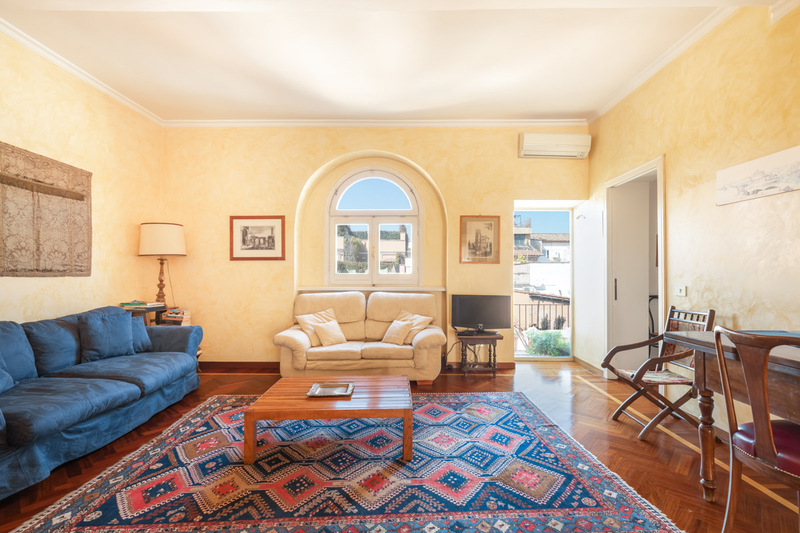 This Rome rental is an excellent solution for those who enjoy large spaces. 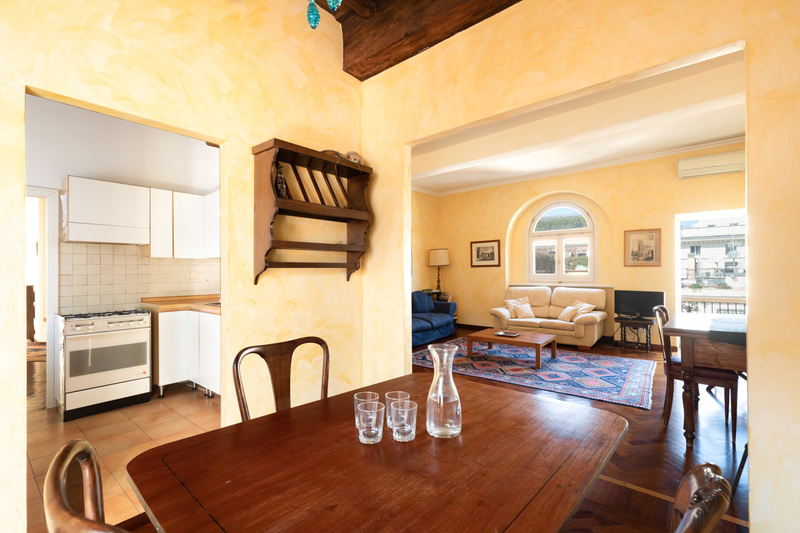 It is also perfect for those looking for a convenient location in the historic center of Rome. 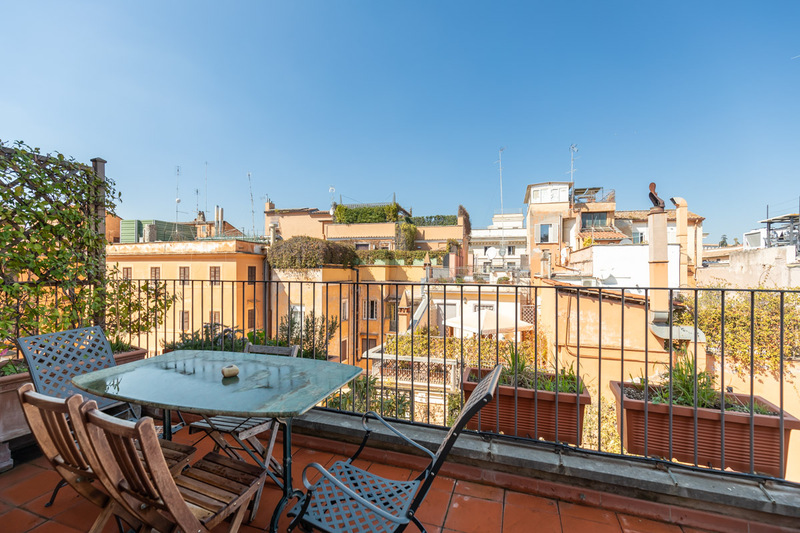 This apartment has a great location, between two of the most beautiful of Rome’s attractions, the Trevi Fountain and the Spanish Steps. 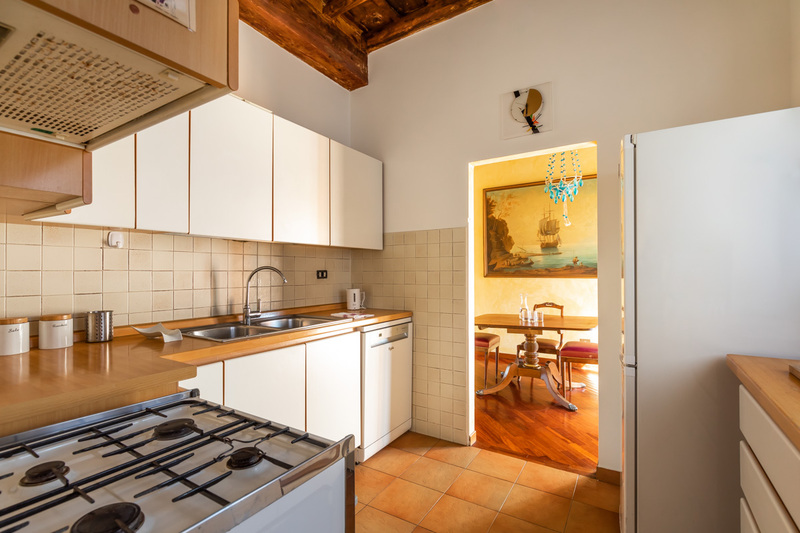 Moreover, it is within walking distance of the Piazza del Popolo, the Pantheon, and the Piazza Venezia. Moreover, here you will be on the Metro A line. This will take you through to the Vatican in one direction, and the central station, Termini, in the other. From here you can change to the Metro B to arrive in the delightful Monti district, the Colosseum, and the Giardino degli Aranci. The area is also a great place to be come evening. You will find many elegant bars, and refined restaurants, serving international and Roman food, depending on your tastes. This is the perfect way to end a busy day of sightseeing. Alternatively, during the day you can profit from the stellar shopping opportunities in this area. High street brands such as Mango and Zara have their stores here, as do exclusive brands such as Gucci, Dior, Salvatore Ferragamo, Max Mara, and Prada. Our family of six spent three nights in this unit last week. As a first time visitor to Rome, I can say that this unit was fantastic! The location is amazing (steps to major sites, transit, etc, plus a grocery store located at the base of the building, and a cafe right across the street). The unit is so close to the Trevi fountain, that we were abl...Read Moree to visit it morning, noon and night...made for some great pics when the crowds were smaller. The unit is much larger than I thought it would be - it is very spacious, and nicely decorated. The two washrooms, washer and dryer, sleeping areas, etc are great for a larger group. There are piles of books about Rome in the unit, which were enjoyable to read. The balcony and balcony seating was fantastic - we sat outside frequently, and enjoyed seeing the herbs and other plants, and looking over the rooftops. The kitchen is well appointed with all the basics. While we mainly used it for breakfast and night time snacks, it looked like every type of pot, dish, cup and utensil was available. One thing to note is that the unit is on the 5th floor - so there are quite a few steps to walk up and down. The pitch of the stairs is gentle though, so it is not a bad climb. There is an elevator which we used for getting our luggage up and down, but it is quite tiny by comparison to elevators at home. This wasn't a huge issue, and the tradeoff of the terrific location and spacious unit more than made up for the stairs. Lorenzo and his staff were all excellent. All of our questions were answered quickly, the checkin and checkout process was easy. We had an excellent trip and I would highly recommend this unit. We had so much fun. We were a family of 5 (2 adults and 3 kids under 5) and this was perfect for us. The boys loved the location and exploring Rome. Being so close to the Trevi fountain was great, as was the walk to the Spanish steps. Having a grocery store at the bottom floor was priceless--as we were able to do meals in the apartments a few times...Read More (although there were many nearby restaurants). Apartment well furnished and supplied with useful guide books. We enjoyed the use of the terrace which was peaceful.The ice drawer of the freezer could do with a defrost and clean. The ensuite bathroom for the master bedroom could do with a better shower attached to the wall.Otherwise we were impressed by the decor and space of the apartment and it...Read More's proximity to a useful supermarket, cafes,restaurants and the Trevi Fountain. 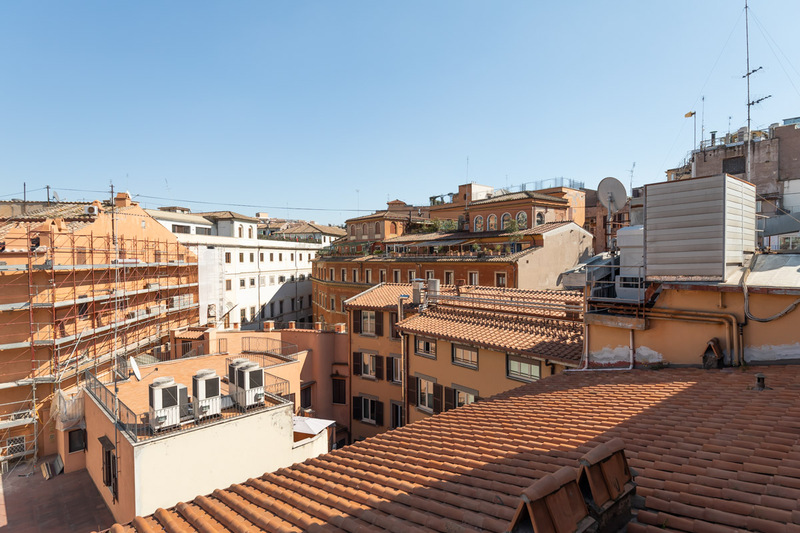 The apartment, whilst quite difficult to locate originally, is in a superb location very close to both the Spanish Steps and Trevi Fountain. For being so central, within the apartment on on the balconies, it is very quiet with no street noise whatsoever (the apartment overlooks the back-courtyard areas). There were four of us in Rome for a long w...Read Moreeekend and the apartment was perfect - much larger than it looks on the photographs. We would definitely consider booking again for our next visit. 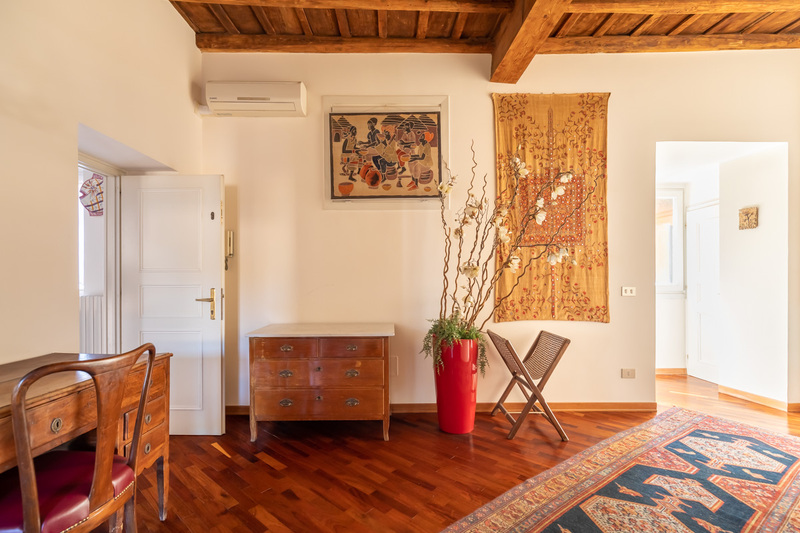 Excellent location in easy walking distance of all major historic attractions including colesseum, forum, palatine hill,pantheon, 'wedding cake', vatican, and of course spanish steps and trevi fountain only minutes away. Super coffee shop across the street for breakfast and no shortage of excellent restaurants nearby. Main shopping area v...Read Moreia del corsa also nearby. Apartment is on 5th floor of very old building with elegant hallway and marble staircase, and lift! It is spacious and has character, nice little balcony and modern bathroom and shower room. Slight issue with smelly drain in shower room but i guess this is not uncommon in Rome. Very comfortable for 4 people, sofabed for 5th not so comfortable. We did no cooking at all so i can make no comment re kitchen. Overall we had an excellent stay and would come back again. 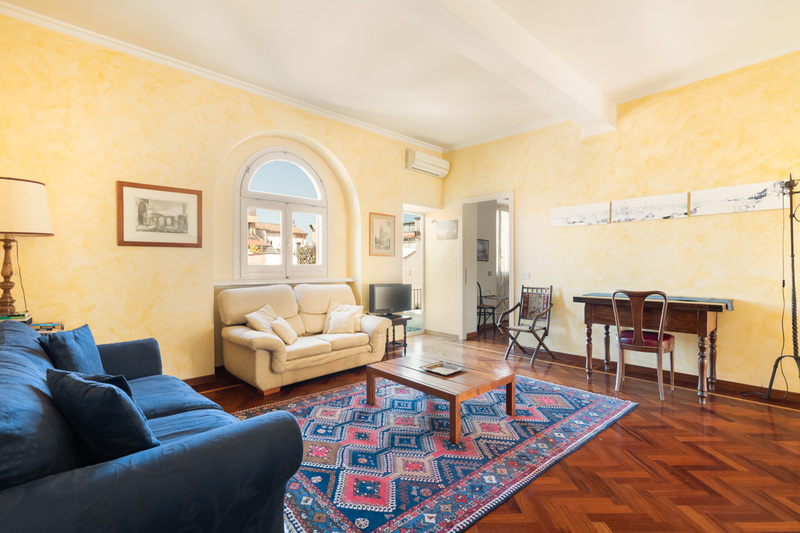 What a wonderful property - a 3 minute walk to Trevi Fountain, supermarket on ground level of building, would highly recommend this to anyone looking for a holiday stay in Rome. We travelled with a 14 and 12 year old, and the place was big enough for all of us, wi fi worked, and everyone was happy. Lovely and secure, quiet, well heated (we were the...Read Morere in winter), and even laundry detergent provided! Thanks for a great stay. My adult daughter (who lives overseas) met me in Rome for a 10-day vacation, and Romeloft had been recommended by a friend. So I was happy to find this 2-bedroom, 2-bath apartment. It turned out to be even better than expected. The location was quiet, even though it was walking distance to the Trevi Fountain (and many other sites). The rooms were s...Read Morepacious and comfortable, and the bed in the master was very comfortable. The bathrooms were clean and functioned well. And there was a good washing machine and a dryer. Also, there was a beautiful little terrace. In the basement of the building was a full grocery store, which was handy for picking up breakfast food and wine. Across the street we found a little bar and cafe, and many, many other good places to eat and shop were easily within walking distance. We also used the Romeloft car service to and from the airport, and that was very reliable and saved us lots of trouble. My only recommendation: Add a microwave (for the leftover pizza)! We would definitely rent through Romeloft again. The flat is in a great location for city sightseeing. It is spacious, elegant and full of character. The double bed was very comfortable and the terrace with pot plants and views was particularly pleasant. On arrival, we had to wait for the host and the whole welcome appeared to be somewhat disorganised with some last minute checks done whilst we...Read More were entering the property. The flat would benefit from a more detailed clean and there were some dust and crumbs left in places. Also, there were no even basic toiletries or hand towels available. Some of the terrace chairs were malfunctioning and uncomfortable to sit on. It would be very useful to have a city map provided for the guests. This is a nice apartment in an excellent location. There is lots of room and it is kept up well. The check in day seemed a little hectic since the company had a lot of apartments to get people checked into. We had to wait a little while but otherwise it was fine. The only other minor negatives would be that you can only get to the bathrooms through...Read More the bedrooms, which is a problem is someone is sleeping on the fold out couch, and the bunk beds are really squeaky (which is why someone was on the fold out couch). The terrace is a nice touch but we didn't use it. It was warm when we were the and it is in the sun in the afternoon. The grocery store on street level is very handy and there are lots of coffee shops and restaurants outside. I'd definitely recommend this apartment. Loved the apartment, there has been a lot of attention to detail. Just two things: the bunk bed makes a lot of noise when the person sleeps in the top bunk. This was so disturbing that we ended up putting the top mattress on the floor. Secondly - it would be useful to have a warning about mosquitoes and perhaps have some of those electronic devices...Read More that deter the mosquitoes? But overall a very pleasant stay. The Apartment was perfect for our needs - one couple plus a single traveller. 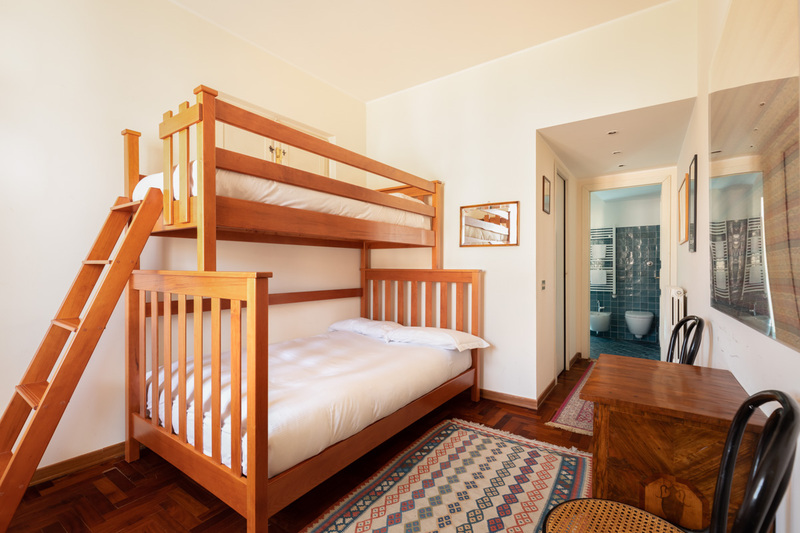 It is very quiet and there is a lovely sized terrace accessible through one of the bedrooms. The position is very central and walking distance to all the main sites. The Supermarket downstairs is an additional bonus and so convenient. The check-in process went very sm...Read Moreoothly and on time which is always great when you travel a long distance to arrive. Overall the Apartment is excellent but the shower/bath in the second bathroom is unsatisfactory. The shower hose could not be placed in an upright position which made it very difficult to use. The wall above the bath should have a handrail as well to assist with getting in and out of the bath as it is slippery and as a consequence, downright dangerous and a safety issue. When this is fixed the apartment will be top notch. To be clear, we did not inform the management whilst we were there - we chose instead to 'share' the shower off the other bedroom. We loved our two-week stay in this centrally located apartment. Having a terrace where we could have our meals added tremendously to our vacation. Quiet apartment. Very homey as it is decorated with the families own special pieces. The two sofas in the living room need to be replaced or slip-covered as they are stained and detract from the othe...Read Morerwise special ambiance of the apartment. Also the kitchen cabinet kick plates need to be secured. We would definitely return to stay there should we find ourselves back in Rome for any length of time. The apt was spacious and comfortable. We arrived earlier than expected, but the staff made every effort to finish cleaning up the place but without sacrificing cleanliness. We expected the air conditioners to be in the bedrooms -- but even if these were in the living room, the rooms were still comfortable. This is important during the summer mon...Read Moreths. It's a bit inconvenient that we need to be mindful that we cant use the airconditioners at the same time as the washer & dryer. We had a bit of an incident when the switch tripped but the instructions weren't complete to bring back the power. perhaps it would be better to have complete written instructions left in the apt so that nothing is forgotten in addition to walking the guests through these instructions. Although the apt is quite old -- but the location makes up for it. For a short visit, it was important to have a comfortable & convenient location. we all agreed it was perfect for our visit. The appartment is great. Great rooms, nice building and a nice terrase. Very quite and you can rest and sleep perfectly. The only -point: please exchange the bathroom fittings and accessories. We are coming back soon, very soon!!! 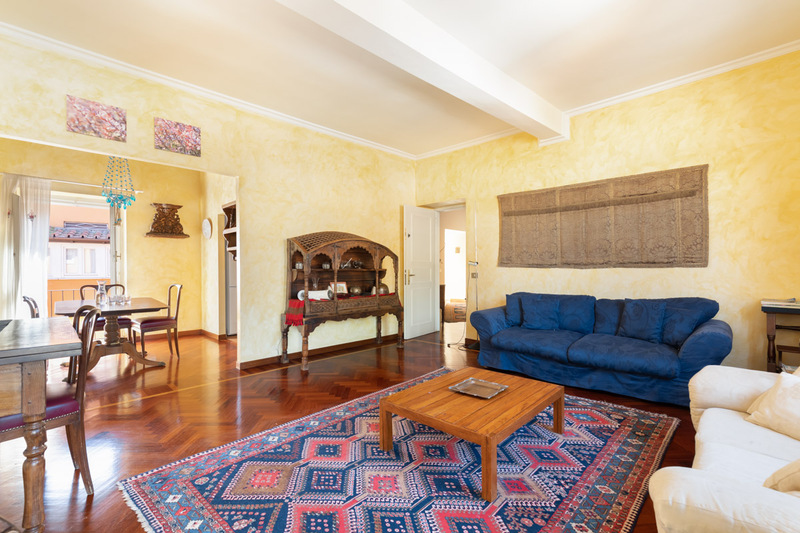 + excellent location (you can discover Rome on foot!) + next to the grocery store with everything you need + pleasant balcony + large, spacious rooms and bathrooms + well equipped kitchen + car transfer – nice, helpful drivers - cold flat - sofabed in the living room to exchange I recommend Romeloft.com to all who want to though for...Read More a moment feel like a real Romans! Ciao!! We were picked up at the airport, as organised by Romeloft, by a friendly helpful driver who dropped us right at the door of the property. We arrived early but the key holder arrived within a couple of minutes. Nissar (our key holder) couldn't have been more helpful and showed us around the apartment and was on hand to answer any queries. Th...Read Moree location was perfect, everything we wanted to see we were able to do on foot and there were lots of good local places to eat and drink nearby. The shop downstairs was a real bonus for getting essential items and meant we were able to toast our arrival with a glass of Prosecco! 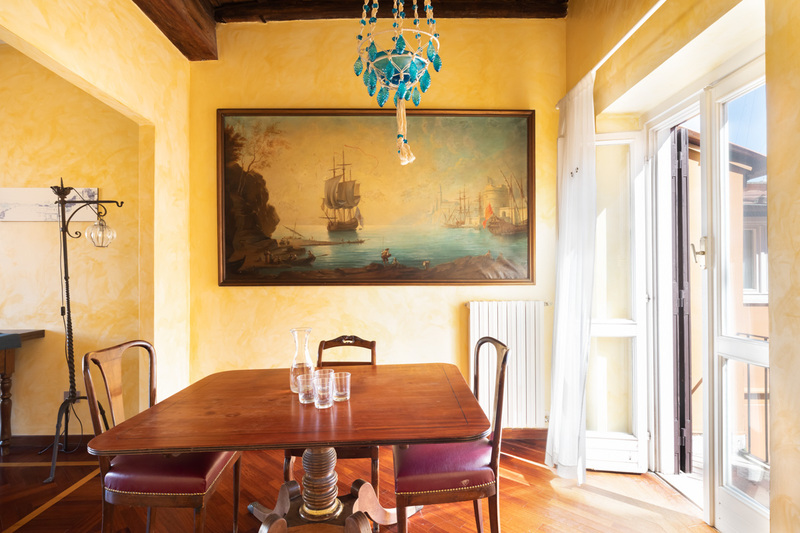 The apartment itself felt like a Roman family home with lovely family touches. There were helpful extras such as Roman history and guide books, and a Moka machine, perfect for that Italian morning coffee. We are already planning our next trip! An ideal apartment for a family or group wanting a central location to see the sights. Staff were helpful and communication was excellent before and during the stay. The taxi service for pickup and drop off at the airport was a bonus. Excellent location. Very attractive apartment, well fitted out. 2nd bedroom awkward shape, not well appointed. One or two things not working e.g. 2 of 3 lights in kitchen, no spare bulbs found. Strangely, only one wine glass, but rest of kitchen appliances, crockery etc fine. Somewhat hurried introduction from person who met us whom we thought wa...Read Mores Mr Honey, but was not. Mr Honey appeared later when we left our bags, for which he tried to charge us - only bad experience of the whole thing. Pleasant, restful apartment with beautiful terrace, conveniently located directly above a small grocery store. Made a great base for touring Rome. Enjoyed dinner on the terrace. Could have used instructions about how to operate the appliances and shower. This was our first experience booking a vacation apt. The property exceeded expectations. The location was perfect and we walked to all the attractions. There was a small grocery store close by which was handy. We had one issue with a sink, and the property manager stopped by within hours. The apt. Is bright, roomy, clean and well stocked. T...Read Morehe dishwasher required a little muscle to get operating. It was nice having a washer/dryer available. The apt. was quiet and very secure. We definitely felt itwas a great value. The apartment was extremely homely and comfortable and aesthetically furnished, a real home from home. All facilities were excellent and lacking in nothing; the master bedroom was large (with a very comfy bed), a fully equipped kitchen, a second bedroom for the children (who loved their hi tech shower with massage and radio), a lovely terrace fac...Read Moreing an open space, and comfortable living room and dining area. Even the washing machine and dryer proved to be an asset, even though I hadn't thought that we would have need of them. It was a real pleasure to step into the apartment each time we arrived home. The location is fantastic. 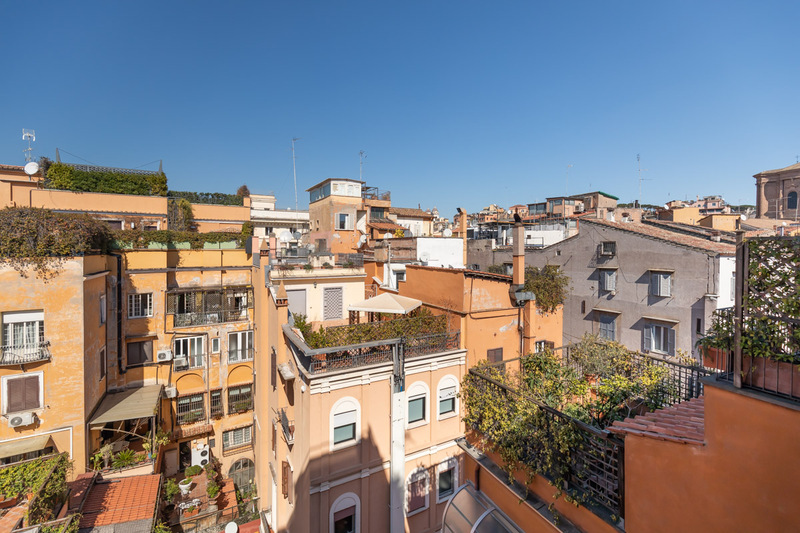 right next to trevi and in walking distance of most central places, and additionally, for when one tires, close to metro, bus routes and even taxi stand. A super market is right below making it easy to shop for self catering (and a pharmacy right by which was useful as we were in need of gluten free products). Despite it being so central, the apartment was extremely quiet and tranquil . The service from Rome-loft was also excellent. We received a prompt response to every e-mail, we were met at the airport with no problem even though our driver had to wait a long time for us to exit ( a suitcase got lost ) and we were shown into the apartment with no delay. Wi-fi works constantly. Although I have made numerous accommodation bookings over the internet over the years, there is always that initial worry that reality wont match the advertisement. In this case - we couldn't believe our luck - the apartment was well beyond expectations. We had a wonderful stay and wish we could have stayed for longer! Great experience renting through Lorenzo. The Trevi apartment was exactly as pictured/described. We loved it! Great location and great layout for our family of four. There's a grocery store on the ground level of the apartment, which was super convenient. There are several bars, coffee shops and restaurants very close to the apartment -- easy...Read More to walk to all of them. We booked our car service through Lorenzo and our very nice driver was waiting for us at FCO, as promised. Mr. Honey met us with the keys upon our arrival to the apartment and gave us a walk through of the unit, which was very helpful. I highly recommend this apartment and this host.